Primitive Summer Saltbox with Flag Hand Painted Plate . A unique home decor piece for your summer decorating. I've hand painted this antique white saltbox house with a willow tree alongside and the AMERICAN flag flying proudly over head. The house is surrounded by Burgundy, Cream and Navy Stars with a little fence in the grass. 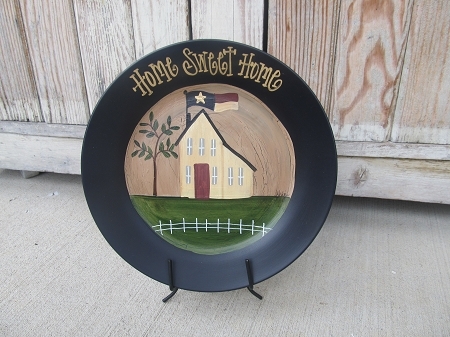 A great plate for the summer season or to add to your Americana decor. Customize with your choice of saying and rim color. Plate sizes vary because I repurpose stoneware ceramic plates. Main image is shown with a dark navy blue rim. Average size is around 10"-11" in diameter. Not for food use but decorative purposes only. Plate rack not included. Hand painted & designed by Heidi at Gainers Creek.